A warm welcome from your hosts, John and Joanne Manol, awaits you at Benson Bennet House. 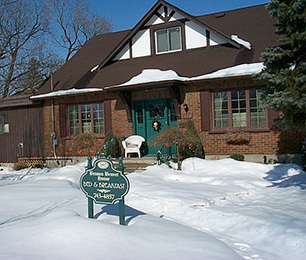 We are committed to providing that personal attention needed to make your stay in Peterborough a memorable one. Our home is conveniently located in the Historic Teachers' College area and minutes from downtown. The Benson Bennet House provides a perfect starting point from which to enjoy the many outstanding attractions in the area. The atmosphere is leisurely and casual. the rooms are intimate and each has its own special decor and nostalgic furnishings. Picture yourself in one of these settings, Lavender and Lace, Victorian Rose or Memory Lane or the garden suite. All rooms are tastefully decorated and very comfortable. The guest rooms and the bathrooms are separated from the family quarters. You can be part of our family if you wish or choose complete privacy. Enjoy your delicious breakfast in the enclosed gallery overlooking, patio and water fountain. The Garden Suite, your own private retreat, with its warm and inviting fireplace is equipped with a queen bed, cable TV, refrigerator, microwave, coffee pot and ensuite bathroom. Private kitchen facilities available for our longer term guests. Your hosts, John and Joanne Manol. View of house from front garden.